The new Local Rules were effective February 1, 2013. The Local Rules and the Redlined Version of 2012 Local Rules with 2013 Changes can be found on the Court's website. 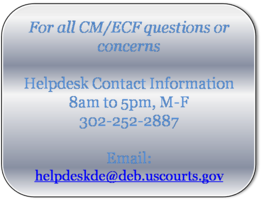 As of March 4, 2013, the Court no longer accepts ECF registrations in paper format. Applicants for an ECF account are required to complete an electronic registration request through an online attorney registration program. The new online system streamlines the registration process, making it quicker and more convenient for applicants. The online registration program can be found on the Court’s website under the general information button on the “For Attorneys” page. Effective May 1, 2013 a $25 fee will be imposed on all Transfers of Claim. As of May 1, the CM/ECF event will be updated to require payment when docketing a Transfer of Claim. CM/ECF will be upgraded to version 5.1 during the weekend of April 13, 2013. The exact times expected for downtime will be posted on the website the week before the upgrade takes place. As of March 4th, attorneys have the ability to add filing agents to their CM/ECF accounts. Instead of registering for several different attorney accounts (for your office personnel), you can add several filing agents under your one login. Click here for instructions on creating a filing agent. As of February 1, a feature in CM/ECF was enabled to allow a header to be viewable at the top of all filed pleadings. The header will consist of the case number, document number, date the document was filed and page number(s). It is important to remember that when you have this feature enabled, any pleading you print from CM/ECF will include the header. Note: The header should be disabled prior to printing proposed orders - do not submit a proposed order to chambers with a header. Click here for instructions on enabling a header.